The DI Accessories Pad Cleaning Spur is designed to clean your wool pads safely and easily. The fibers in a wool pad are what gives this pad the cutting power we all love, but during a detail the fibers can become caked with polish and the pad can become matted. This not only effects the polishing results you will have, but it can cause the pad to heat up faster, greatly reducing its durability. When polishing you may try to wipe them down with a microfiber towel, or even clean them foam pad cleaning brush and while these methods certainly help, there is room for improvement. This is where the Pad Cleaning Spur comes in handy and really enhances your pad's performance! With the pad still attached to your polisher, use a low speed setting and touch the spurs to the surface of the pad. As the pad spins gently, the spurs will separate the wool fibers and clean away the old polish. The pistol grip makes this spur easy and comfortable to hold, so you can clean your pad with minimal effort. Once the pad is clean, continue polishing, stopping as needed to clean the pad again. When you are finished polishing, we all have various different pad cleaning techniques and products we love (i.e. Lake Country Snappy Clean Boost Pad Cleaner). Whether you let your pads soak, or run them under water, this Pad Cleaner Spur can be used to help separate the fibers during the final cleaning processes as well. No matter if it is wool pad cleaning during or after polishing that you are looking for, the DI Accessories Pad Cleaning Spur makes a great addition to your detailing arsenal! 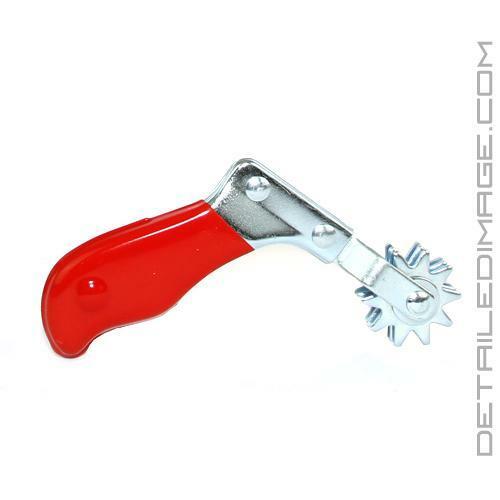 A pistol grip tool with rotating spur for easy cleaning of polishing pads and bonnets. Ive used brushes, buckets, and this cleaning spur and I can say with confidence that this spur is worthless. The concept is good but being made of metal it leave your pads discolored with black streaks. I'm a mechanic and when handling metal (regardless if you think its clean) your hands are always black. You pay good money for your pads so look at DI's other options for pad cleaning. Very disappointed in this one.